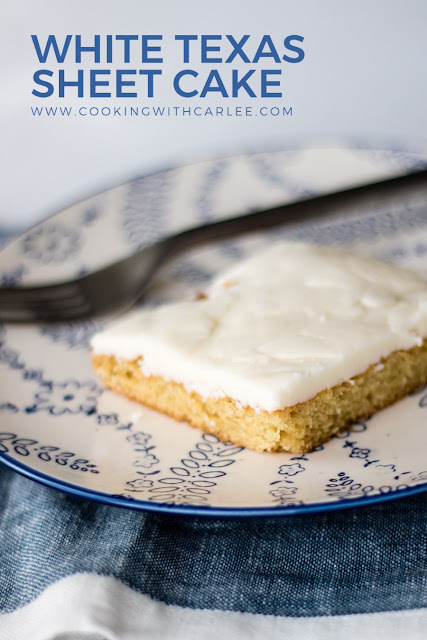 The simplicity of a Texas Sheet Cake made with white cake and white icing, my dad's favorite combination! It is great for feeding a crowd and will be perfect at your next BBQ or potluck! 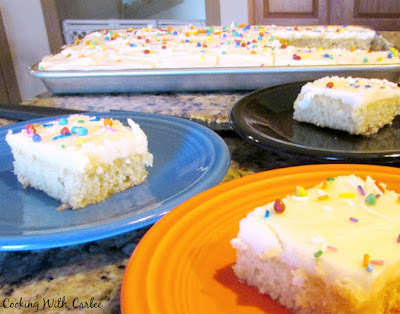 Make homemade white cake and white frosting in the simplest possible way! This cake is made like the chocolate Texas sheet cake, all in saucepans, but there's no chocolate in site. Take a big old sheet pan and get to work. This recipe makes enough to feed a crowd with very little effort! I figured it was time to update the pictures and add a video to the post. It seemed like a few of the original pictures should stay for nostalgia sake though. So enjoy some of the old and some of the new. Of course a few sprinkles liven it up if nothing else! I'm not quite sure what got me started looking at sheet cake recipes, but I spent an entire morning pinning different ones to my Pinterest page. Father's Day was coming up so I asked Pops to choose one. He really likes a white cake with white frosting so it didn't surprise me when he chose this one. Most cake recipes require softened butter and room temperature ingredients. I don't always plan ahead when making cake so I was really happy to find that most of the sheet cake recipes were started in a pan on the stove. No planning ahead required and most of the ingredients are staples in our home. The icing is cooked also. Again, no softened butter needed. Another advantage to this kind of sheet cake recipe is that you put a warm icing on a warm cake so it smooths itself out pretty well. No worrying about crumbs surfacing as you ice the cake. I have made a traditional chocolate Texas Sheet Cake many times. I think I will be making this one and some new ones again and again. This recipe is quick, easy and fun to make! 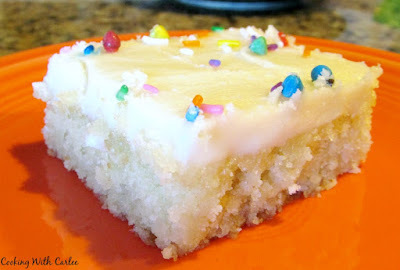 I followed the recipe for White Texas sheet cake from Kitty's Kozy Kitchen. After reviewing several recipes, I realized that most of them follow this same recipe. The only change I made was the addition of 1 tsp of vanilla in both the cake and icing recipes. I really like the way a combination of vanilla and almond extracts taste in cakes and icings. Texas Sheet Cakes are so easy to put together and great for feeding a crowd. This white cake and white frosting variety is my dad's favorite cake flavor combination! Bring butter and water to a boil in a large saucepan. Remove from heat and stir in remaining cake ingredients. Pour into prepared pan and bake for 22 minutes. Bring butter and milk to a boil in a large saucepan. Spread warm frosting over warm cake and let cool completely before serving. I love Texas Sheet Cakes! I've been making the chocolate ones since I was 16, wayyyy back in the day! I believe I've tried this one, but so happy to see the recipe so I can pin it, in this age of technology. lol....thanks so much for sharing. The peanut butter one is also delicious, and sometimes, I make one flavor cake and another flavor icing. Such an easy and delicious cake. This looks so yummy! My hubby is a big fan of simple sheet cakes and this one looks like a winner in his book. Thanks for sharing at Inspiration Thursday! Hope to see you next week. Sometimes simple is really good! It had been quite some time since I had a sheet cake, but I have been getting into them again. This is the third one we have had this year! My littlest sister was in heaven with this one. It had been a while since I made a sheet cake, but now I am on a roll! I can't stop making them. They are so easy and fun! It is so hard to pick what flavor to do with so many options, but sometimes it is really nice to have a white cake and white frosting! It is my dad's favorite and one of mine too! I want a piece right now! Thanks for sharing on My 2 Favorite Things on Thursday!! Hope to see you again tomorrow!! Pinned! 9x13 jelly roll pan? I have a 9x13 cake pan, is that the same thing? A regular 9x13 would work as well, it will just sit lower in the pan (or you could use a slightly larger jelly roll pan). It is just easier to frost when the the side of the pan are lower. I had MiMi remeasure the pan just to be sure. The pan she used is 9x13 on if measured on the bottom, but it flares slightly and measures 9 1/2x 14 1/2 on the top, so I would imagine that would sell as a 10x15 with an inch lip. I think a 9x13 would work great, I would just add a few minutes to the cook time as it will be a little thicker cake. Looks so good, and I REALLY love the thick frosting! =) Thanks so much for sharing with us at Weekend Potluck. We all loved it so much it's featured at this week's party...please keep 'em coming. And may you and yours enjoy a fabulous 4th. I think frosting make the cake, so there has to be a good balance of cake to frosting! Thanks so much! Have a great weekend! Is this cake supposed to be not very "cakey" or did I do something wrong? Texas sheet cakes are traditionally thinner than a regular cake (like a cake mix cake). Is that what you mean? It should still have a cake texture, just not as tall as you might be used to. Maybe slightly denser too, but you should definitely recognize it as being cake. What does yours look like? Is there a way to modify this recipe for a smaller crowd? Thanks! We have never tried it, but I don't see why you couldn't half it and make it in a 9x9 or 8x8 pan. Just watch it in the oven so you don't over bake it. This brings this misplaced Texas girl back home :) Thanks for sharing with us at From The Archives Friday! Thanks for hosting! Texas sheet cakes are some of my favorite to make! I love a good sheet cake, and this would be a crowd pleaser! I'm so glad you joined us at Celebrate 365 Blog Party! Thanks for having me, Jan! I do love sheet cakes too! We did a bunch of them the first year I was blogging. I really should revisit some of them this summer! Carlee, I love making sheet cakes! And I've always preferred vanilla rather than chocolate, too! Thank you for hosting the link party. We grew up basically only eating the chocolate version, but we spent a whole summer trying new flavors. The vanilla version was definitely a hit! Thanks, Jean! I don't see butter listed in the cake ingredients. How much butter is melted mixed with water in the saucepan? Thanks! Can't wait to make it! Kathy L.
A cup of butter goes in the pot with the water. I hope you love it! The perfect sheet cake. You and MiMi are he sheet cake queens! Love that you tried new flavors. Thank you! We love doing different flavor combinations! Hi Carlee, I really must have a go at making a sheet cake. This one seems so simple... I really fancied making a cake a couple of days ago, well to be honest, I had that brownie feeling again, but there was no proper butter in the house. It was heartbreaking. It's now top of my shopping list. They are so easy to do and perfect for feeding a crowd! And now I am heartbroken and wanting brownies too. Get that butter ASAP! I love a good white cake, so I will definitely be making this soon! White cake and white frosting is super popular with my family as well. I hope you love it! I love when Mimi guest posts! I have never made a cooked frosting. It looks so delicious! She is great, isn't she? I love cooked frostings, you really need to give them a go! It is so fun that you can have Mimi guest post. The white Texas sheet cake looks fabulous. It is fun when she shared with us. She is really good at making fun Texas sheet cakes! This looks TOO delicious! I love any kind of sheet cake and this looks fabulous. Thanks so much for sharing at the Whimsical Wednesdays Link Party!! We are big sheet cake fans too! Thanks! 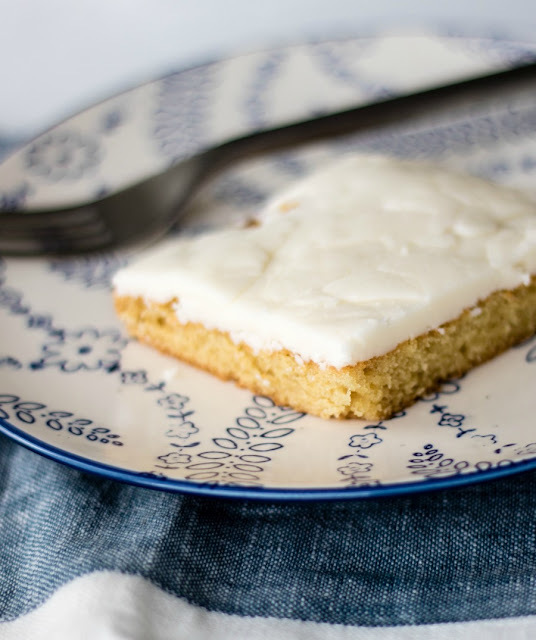 We will love your White Texas Sheet Cake, it looks delicious! Hope you are having a great week and thanks so much for sharing with us at Full Plate Thursday. Pass me a slice please!